Why Internships are Important for Employers and Students? It is needless to say that in this day and age, there is cut throat competition between companies and it is only the companies with the best employees that are able to attain great success. An internship is a training of sorts given to employees who wish to attain corporate or white collar jobs. Having a good internship program is something that has dual benefits, for students and as well as companies alike, for your benefit given below is a comprehensive list to show why internships are important not only for students but also for the companies as well. Why are Internships Important for the Employers? The only thing constant in the world is change and keeping this very thing in mind it is important to note that no matter how well your company is doing at the moment and how loyal your customers seem to be, you can never be too sure about how things are going to be in the future. An internship program is important for your company so that you are able to be on the lookout for promising and quick potential future employees so that you know that the future of your company is in safe hands. You must be on the lookout early or else you may lose out on invaluable employees. As we all know doing internship programs last for a limited period of a few months and within that time frame you as an employer get to take maximum advantage of this short term support. However this having been said, it certainly does not imply that you go out of your way to exploit the students, it merely means that in the bid of them trying to learn new things you too are able to get some important work done by them. This relationship is not a one sided one, but rather it is a symbiotic relationship where both trust each other as well as depend on each other to get ahead. It is only fresh and novel ideas which are able to get the company ahead. Very often it might just happen that employees that have been working for a company for a while might lack inspiration and no matter how much they might try they are not able to come up with out of the box ideas which will really attract the customers, at such a point in time, the valuable and novel insight given by the young interns could really be instrumental in allowing the company to get back that spark which was lacking for all this while. Bright ideas can really help the company to get noticed. One of the best parts about an internship job is that the interns come in with a fresh and novel outlook on problems solving and project execution, they are always ready to do any work that is given to them and unlike the other confirmed employees of the office, these young interns are constantly trying to deliver top quality work at all times and under all circumstances. This being said, the biggest bonus is that the interns are such low cost and even free of cost labor which you are putting to maximum use without having to invest any money in them. They are truly an asset. Not many employers would realize that when they have an internship period, not only are they able to get more hands to get their jobs done, yet at the same time they are able to give invaluable help and support to young students who might be a little unsure of themselves. An internship program like this is extremely important as it is an opportunity for companies to give back to the society and help the youth of today because after all, our future does lie in their hands. If they are not given the proper opportunities they will never excel. One of the most basic reasons which point to the fact that why internships are important to employees as they are able to test drive the talent and see whether or not there are one or two interns who they should keep an eye on and even offer a job once his or her education is complete. Companies are always on the lookout for those employees who they know will be able to keep the company banner flying high and know exactly what they are doing. Employees are all the backbone of the company and without them, the company will never be able to climb the ladder of success. Though everyone might not admit to the fact, in the business world time and money are both invaluable resources and at no point in time should be wasted. This having been said, top companies have the capital to spend as much money as they think fit in order to hire the best of the best in terms of manpower. Yet smaller companies or businesses work on a water tight budget and cannot afford to spend money at will. So for such companies, having interns works absolutely great for them as they can get their work done in a proper manner and at minimum expenditure. Last but certainly not the least is that one of the major reasons why internships are important, is because it gives employers the chance to get jobs done by interns who are always eager to please and impress the company seniors and bosses. So even entrusted with even the simplest of jobs, they will try their level best to go out of their way to take extra care over it and this is something which permanent employees may not take the added pains to do now as they need not try and impress their seniors at each turn. Why Internships are Important for the Students? Unless you are truly aware of your strengths as well as weaknesses you will never be able to know what you are truly capable of doing. 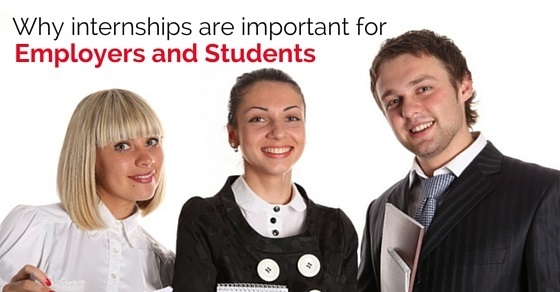 Internships provide students so much more than what can be expressed in words. They allow internship student the unique opportunity of really getting to know who they really are as individuals. Previously they might have perceived themselves as weak and timid but later on, they might be shocked at how very strong as well as capable they really are, as not merely as interns of a company but also as individuals in general. One of the most important reasons why internships are important to students is because owning to the fact that they work so hard for little or no money at all, that is why employers cannot possibly expect the moon from them. They are expected to do their very best no doubt, but at the same time, they are not too severely penalized in the event of making some rookie mistakes. So it is these very mistakes that will help the students to improve and grow as employees. After all, as we all know failure is the stepping stone towards success. Making decisions is something which is easier said than done. In the course of our lives, one of the most difficult decisions which we are expected to make, pretty early on in our life is the decision of which career field we would like to join. This having been said, an internship is very important for students as it allows them to actually gauge whether this is something they can really see themselves doing for the rest of their lives. If it is, then good. If it isn’t then maybe it is a time they start thinking of other lines which they can enter and prosper in. It might often occur that most of us enter a career field because rather than it being our dream we want to fulfill the dream which our parents or other family members have envisioned for us. This being said, your career should be your decision and though it is perfectly fine to take advice and seek counsel from others you should only follow the dictates of your own mind. There are many benefits of an internship for students as a student internship gives student the chances to get a glimpse of what the business world really is and that it isn’t an easy place to survive in. In the business world, rather than only being able to talk the talk it is mandatory that you also learn how to walk the walk. Companies want employees who know how to act in a proper manner so that in the event of an investor or a customer entering into the office the employees are not indulging in any act which is indecorous. So when they are interning, students really learn what is expected of them when they are representing a company and they also learn what to do and what not to do in the office as well as what they should wear and what they should refrain from wearing at work. Going for an interview is a challenge in itself and even more tough than that is trying to crack the interview. Once you are employed full time to a company you cannot possibly imagine that you will be taught things from scratch. Companies prefer to hire those employees who have some internship experience as opposed to those who are freshers, this is because they will naturally be quicker on the job as they already more or less are aware of what is expected of them when they work in a big corporate company. The more you as a student intern the better it is for you in the long run. Small things like this do make a big difference. Which you have and the companies which you have been associated with in the past. Even if you worked for no salary at all in the given company, it will be of valuable use to you that you have been affiliated with or interned with such a top company. So after all these points, it is needless to say that internships programs are absolutely vital not only you help the companies but also a benefit for students as well. These students are the future of the business world and if they start learning the ways of the business world from a young age, then as they gain experience as well as exposure they will only become better with time. Job internship programs are stressful and might be difficult to organize, yet their manifold benefits to both concerned parties will exceed the cons.